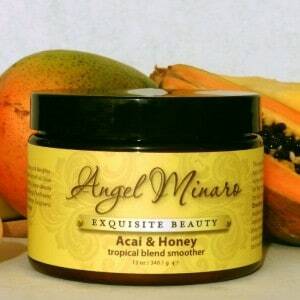 I was very eager to try some lotions and scrubs from Angel Minaro, a company founded in 2009 that sells a luxurious line of beauty products containing only natural ingredients. All products are made by hand in small batches, so any product you order is fresh. Everything is paraben-free, and absolutely nothing is tested on animals. Angel Minaro is certainly an eco-friendly company, recycling as many materials as they can to contribute to preserving our environment. When choosing a product to try for myself, I immediately went to the Mani/Pedi Care section of the site to see what was available for my poor, miserable feet. The Peony and Acai Lotion is what I selected, and I couldn’t wait to try it. 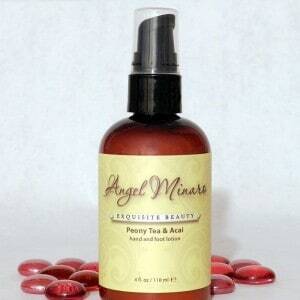 I was delighted when the owner of Angel Minaro, Angela Heitz, also included several other products for me to try. The first thing I noticed when my Angel Minaro package arrived was how gorgeous the presentation is. I loved the containers, the labels, and the luscious smells. Absolutely none of my every day scented products can even compare to how amazing these smell. This was the first product that I tried from Angel Minaro, and it gave me almost instant relief. The combination of mango butter and peony and acai tea extracts work together to moisturize the skin and make it feel soft and supple all through the day. After just two nights of rubbing the lotion onto my feet and sleeping with some socks on, my feet were looking and feeling so much better. They constantly itch because of the dryness, but the lotion immediately soothed them. This moisturizing créme is perfect for use all over the body. I have been using this after shaving my legs because of the bumps I get from my razor. I see an improvement in my skin right after using the lotion; it makes my skin look healthy and alive instead of dull and lifeless. I hate showing off my legs, but after using this créme, I have gained a new confidence. I love body scrubs! This body scrub is effortless in removing dead skin. It is really effective, so it should only be used at least twice per week. My knees, elbows, and feet are especially grateful for this body scrub. After using it, I like to rub the Buriti and Coconut Milk Moisture Créme on my legs for extra smoothness and moisture. I love the way this lotion smells. I have mostly used it on my legs, but you can use it all over your body. It contains ingredients such as shea butter, flower extracts, silk proteins and argan oil. Argan oil contains vitamin E, which is really good for your skin. 1 lucky Simply Stacie reader will win the Buriti and Coconut Milk Moisture Créme, Acai and Honey Tropical Blend Smoother, and the Romance Ultra Nourishing and Firming Body Lotion. This giveaway is open to the U.S. and Canada only. I like the Rose Menthe hand and foot soak. I want to try the Cucumber-Olive Leaf multivitamin peptide serum. I would love to try the Passion Fruit and Argan conditioning hair mist ! I would love to try the passion fruit hair mist! Thanks for the giveaway! The Chardonnay Silk bath bubbles sound divine! antioxidant toning masque is my favorite product. The passion fruit &argan conditioning hair mist looks awesom3. The Passion Fruit and Argan conditioning hair mist looks interesting! moisture rich body wash, I want it! I like the bora bora rose glow for hands and feeet! The RC thingy wouldn’t Thanks for the great giveaway!!! Well, let’s try this again — The RC thingy wouldn’t let me enter the name I follow you under on Google+ (HollyCunningham) Thanks! The African Kiss body oil sounds wonderful! I would love to try the Babassu and Sea body whip! Ack! Sorry, I forgot my google + name on one of the entries – it’s Sherry Conrad there too. I would like the Coffee and Camellia Tea anti aging facial serum. I love the Deluxe Double Chocolate body scrub! The Chardonnay silk bath bubbles looks amazing! The Cupuacu and Sjea body whip is my favorite product.